I've been toying with adding additional player ships from later in the game, to see how playable they are and maybe rebalance them a little (Benedict's Asterion gunship, Hugo Sandoval's Armstrong freighter, Centurion for dual-fire weapons, etc.). Might release them as they are just for feedback, they feel quite nice for upgrades, especially having from the Corporate side (not just Wolfen, Sapphire, EI freighters and maybe a stray Centurion). I tried the Elixir Megayacht, but it's huge and would probably be ridiculously overpowered or make no sense at all - maybe a scaled-down version between Elixir and Sapphire. The one that's quite ridiculously overpowered and also quite unplayable at the same time is the Minotaur. Having a secondary omnidirectional weapon firing at the same time is huge - end-game you can stick IM90, Ares Lightning Turret or even an Omni Thermo Cannon and pretty much mop curbstomp everything. However, it's also challenging due to the power requirements for most end-game weapons (Omni Thermo is the outlier here - low power usage, uses ammo but you have an ammo fabricator device which doesn't use too much power IIRC) and the ship is very sluggish - a drive upgrade helps, but the maneuverability is still terrible (maybe the drive upgrades should also improve maneuverability - we used to have side thrust effects, so it makes some sense). I was thinking that it would make sense to have the top turret secondary fire instead of linked fire so that you could fire the weapon with another button. It would make much more sense - especially if it was restricted to capacitor weapons, like the Ares Lightning Turret. Or if you could fire both weapons only for a limited time until they would overheat or something like that, to balance the ship a bit. I've been also playing with making the ship much more maneuverable (which is quite fun with dual-fire weapons but the selection end-game is limited), to giving it a large cargo hold and use the NAMI Auton Bay (suffers from stupid auton AI - mindlessly chasing every target with no prioritization, lack of commands - especially to recall all autons, a pain with many of them, and the lack of autons end-game - upgrading Lumiere is okay-ish, but not that great). What I would like and would probably fit the Minotaur better (being a heavily armed corvette) is more dual-fire weapons, especially launchers (a dual/alternating Makyev maybe?) and energy weapons (last one is Tev9 I believe). Minotaur is about a maneuverable as a freighter. It is not great, but not too bad. If player can handle a freighter, he can handle Minotaur. Two primary weapons on top of good all-around stats aside from turning speed makes it better than every other ship except maybe EI200 for cargo capacity. Minotaur's only weakness is maneuverability. I do not want to always hold down two buttons to fire primary weapons most of the time. That is like always holding the run button in Doom to move at normal speed instead of at reduced speed. If player wants to use launcher, that is three buttons for firing weapons alone. Basic keyboards have a limit to how many buttons can be held down and respond. If player uses a ship with many guns, it makes sense to link them together instead of having a fire button for each weapon. As for fixing the Minotaur, there probably should be more high-end options, instead of it and maybe EI200. I was thinking of reducing the firepower upgrade by allowing you to fire both weapons only for a short time, so you'd fire either the primary or secondary (primary for stations/capital ships, secondary omni for lots of wimpy ships, like Sung). The problem with the Minotaur is it's overpowered compared to all other player ships. Unless you have a specific reason for keeping your current ship, switching to the Minotaur is going to make the game much easier. It's pretty much a race to get it as soon as you can past St. K's and you're going to curbstomp pretty much anything until the middle of outer realm, even with the default loadout. Especially the Marauders and Sung Slavers pose little challenge anymore. That might be the point, but it makes the game too easy with double the firepower. What if it was restricted to fleet officers with a certain rank or require a mission to unlock? It might also make sense to have the military version restricted to officers and the civilian version to Corporate security officers. We can certainly add more high-end ships, but they should have some kind of gimmick/tradeoff, not be just a matter of equipment level. There are several good ship choices already in the game to repurpose as playerships, but I'm not sure what trade-offs to make. As I said, I was playing with them, we have Asterion for a heavy gunship, Armstrong for a big freighter and various Centurions. The first two could basically be upgrades for Manticore and Armstrong, although it might make more sense to make them starting ships and somehow balance Asterion, Armstrong and Constellation - they are all based on the same model after all. For Centurions maybe we could add some restrictions to separate them a bit, like unable to mount dual-shot weapons to the basic one, unable to mount single-source weapons to the dual one, maybe no omnidirectional either. But then what might be the advantages for choosing them? They should have a gimmick of their own, I'm struggling to think of one. PS: One limitation of the linked-fire implementation is you can't enhance the linked-fire weapon without removing it, installing a dummy one, then the weapon you want to enhance (so it show's up in the weapon selection). By the time Centurions appear, so do the Minotaur. Centurion/X might be a fun ship to play with, except I want Minotaur when I can get either. With Wolfen, I want light armor because heavier armor really hurts its agility. With Minotaur, it can use heavy armor without losing too much speed. For an alternative high-end ship like Centurion/X or Britannia, it could have another bonus, like a global +50% to weapon damage or something. George seems okay with the idea of buying a better ship (that is clearly superior to the starters). The problem is there is only one or two choices that are clearly better than the starters. The rest (like Centurions) are trivial upgrades or sidegrades. The problem isn't just that the Minotaur is stronger than the other options, it's also that the game was balanced around the starters, so introducing ships that are significant upgrades to the starters makes the game easier. I mean, it's already possible to more-or-less trivialize the game even with the starters -- a +200% omni thermo cannon with nanofac is pretty hard to beat. But it takes significant effort to achieve that level of power. Minotaurs are just handed out at the shipyards, and all you need to get one is money. You could make the endgame harder, which would have the effect of pushing the player more towards upgrading their ship. This is fairly common in other games in the genre, where swapping ships is a big part of how you "level up". You could downgrade the new ships, but that makes the player question why they would bother upgrading. I think on the whole I'm okay with the Minotaur being the strongest combat ship, but it might be too strong currently. Maybe its omni mount should get a halved fire rate and power draw? Right now Centurions are quite crappy. They are worse than the starting ships in pretty much all aspects. But that can be easily changed, I'm playing various games to tweak the ships. You can get the megadrive too, with either a low-power omni (omni thermo?) or an enhanced reactor (ingenuity) or both. That's the point of a heavy gunship/corvette. Wolfen is a light gunship. I think the current armor system is very well balanced - you can use heavier armor (to a point), but it hurts the speed, thrust and maneuvrability. That's what I'm struggling with, what bonus to give to the Centurion or Britannia. Having enhanced weapons across the board feels a bit like cheating. Maybe one Centurion could also have a linked-fire system, for single origin weapons, so you could hack together a dual Katana for example. Maybe have a built-in targeting scanner that makes all missles tracking (so you can have tracking M5 with the NAMI Heavy). Or even a built-in +fast enhacement for all weapons. If we're OK with having purchasable ships with a clear advantage over starting ships, then the only problem is balance - the rest of the game is balanced for the starting ships, so it's easy to curbstomp almost everything, as Derakon says. So I still stand by the idea of locking the best ships under a mission and being able to buy only mediocre upgrades. For example, you might be able to buy the Centurion variants (with different trade-offs) for a few hundred thousand credits, maybe the Brittania for like 500k. But the Minotaur would require a mission to unlock, say maybe get it as a reward in Point Juno or add a mission arc in Eta Ceti. Then we can buff the latter part of the game by 50-100% so you'll really struggle without a better ship. To lock out the endgame weapons we could also play more with the multislot option and have the Minotaur & equivalents simply have more device slots. As for the linked-fire system, I think the weapon should be part of the weapon selection rotation. That way you can fire it independently (eg. without firing a main howitzer just to kill a few ships) and also easily enhance it with usables. Externals should remain as they are. The first Centurion is unremarkable, but the X is decent. If Minotaur was not available, I would consider upgrading from Sapphire or Wolfen to Centurion/X. My point about megadrive is if you want to use two primary level 10 ammoless weapons, like two IM90s (or IM90 plus plasma cannon), plus Taikon-200, Megadrive requires too much power. Titan is good enough for a fraction of the powerUse. Sure, starters can be powerful. It was pointed out to George on Twitch that Minotaur is noticeably stronger than the starters, and he has said at least twice that he is okay with that, at least on a ship that is not a starter but can be acquired later in the game. He (seems to) see it as something to look forward to as part of progression. I am not sure if delaying Minotaur until near the end is the way to go. The end is still the same (you kill the final boss with your souped-up Minotaur). The only difference is you are stuck with a weaker ship (your starter) longer. Maybe one Centurion could also have a linked-fire system, for single origin weapons, so you could hack together a dual Katana for example. Maybe have a built-in targeting scanner that makes all missles tracking (so you can have tracking M5 with the NAMI Heavy). Or even a built-in +fast enhacement for all weapons. I haven't had time to go thorugh the topic in detail but these are great ideas. A linked fire Cent/X variant sounds great. Make the linked-fire system built-in and up the price. The tracking upgrade could reduce missile speed to balance. And the +fast could be limited by weapon damage type or weapon manufacturer. Attach what you've got to a Drawing Board topic, please. That way interested people can have a go with them. I would love to do this type of thing but other mods are taking all my time. 1. Make some sort of chance hit/ miss system, as upgrade (and in addition / not replacement!) to the facing system. 2. Have the guns+slots and their types limits in place. 1. 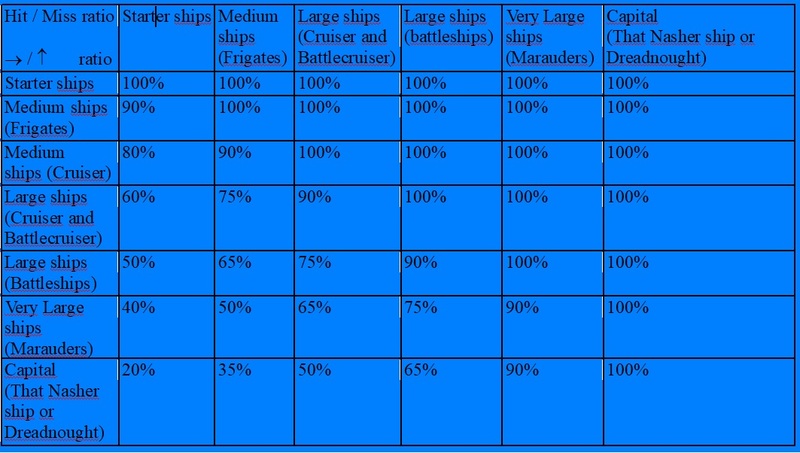 Have for example Small Medium Large eXtra-Large and Capital weapons in place (S, M, L, XL, C) C guns would have a default of 95% miss on small ships, While S guns almost always hit both small and large ships, like 60% on small ships hit chance 80% hit-chance on medium ships and 100% on L and above. 2. current 2 slot guns can be made L (large weapons) suitable for Minotaur and heavyer ships. 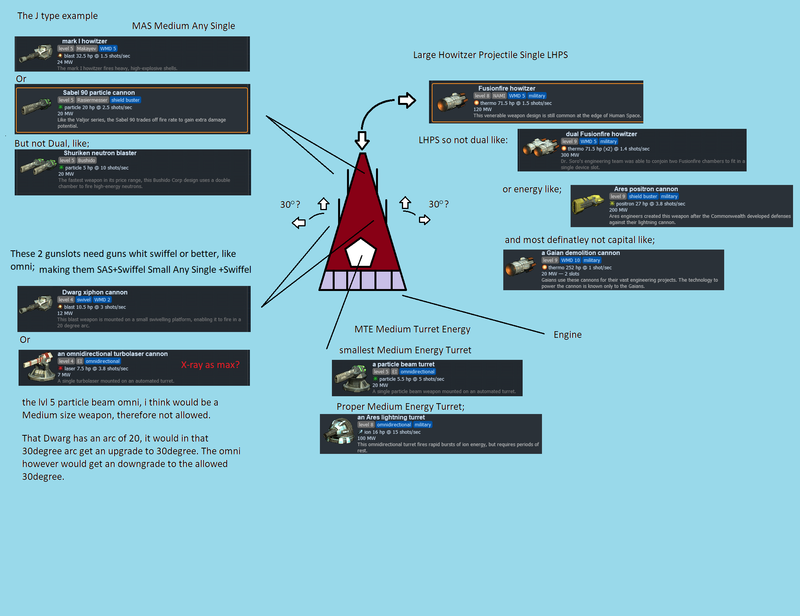 M slots / weapons are the ''heavy's'' for small and medium ships (starters all the way to centuy-X) S or small would be small weapons foe example to lvl 6 or 5. T weapons are turret weapons, and need a turret slot, these also come in the S M L system, and TS Slot for example would be suitable for the starting El500, however, since thats your main primary, that slot should be a MT medium turrets slot, whit the small turret laser in it. An MT would be able to accommodate MT St weapons, but not LT (Large Turrets) nor should it be able to handle Linear weapons, or even swiffel ones. Furter specification can be made due to make some weapon slots capable of Howitzer Energy Projectile ( projectile energy would be the quanlong or ares archon plasma cloud or graviton ehh chimera guns, and ofc lamplighter) and Single and Dual capable. Along whit A for Any, both projectile and energy. So, and LED would be what is currently on the ares dual turrets that protect thier bases. Ares base also have LES same ion turrets that shoot one less both, and last but not least the ares deploy LEPS those are also Large weapon slots whit Energy Projectile and ofcourse Single shot, Dit u guess what it is? yes it is the ares Positron gun on that stationary. However, since the above does not account for it to rotate 360degrees, the stationary nature of those object should ad the the capability of the gun in question. Minotaur + omni lvl 8 ion detected = +10-30% (random or adaptive algoritm?) live resists damage per shot and shots per second, per any enemy ship. PER newly visited system. So, when fitting the ion omni to replace your (ehh that green crappy one.. forgot its name lol ) means u also get heavier enemy's, up that to ''lvl 9 omni ares burst ion.. thingy'' and get yet another +5% per new visited system. This can be ofc duplicated for main guns(s) external(s)guns shield armor and reactor. -1 LHPS (Large Howitzer Projectile Single) so cant be turret or even dual howy ! as a main, on the pinnacle of the ship (cus its a triangle shape) lets say an Regular 120MW thermo howy. -directly behind it on the side of this triangle 2 (one on eigther side ) Medium linear single shot Any weapon slots. MAS Medium Any Single, lets say Makayev Mk-1 blast howy as max. Ill make an piture of this... gonna be simple, but easy to understand. I rather see his current efforts going into combining the EP Eternity Port along whit CC to the main story line, just like he mentioned on his twitch game playtrue.... this in upon itself means you'l be able to pilot the Evren Heavy gunship, easley an match for the current minotaur. He also mentioned that he wanted to intergrate either specific ship sections like crew quarters or gunnery slots for ''hired'' or rescued (sung slavers? )crew members. Or both?. That, would also be alot of work man... alot. the front gun LHPS can be equipped whit an lithium booster and a howy accelerator. The MAS in case you went MK-I can be done whit howy accelerator and the makayev weapon booster. The swiffel gun slots in case of x-ray omni's, laser accels and bushido weapon booster. This items directley applied to the gun that u want it on, allows for the Dwarg swiffel on the right side whit it's ups, and the x-ray on the left side. Also, regular boosters like particle source upgrade, ... or something, would need a selection list, same as longlu spheres do right now, making it possible to up existing guns in any slot, or taht new shingy gun in the cargo bay for future use. Note that this layout has no launcher slot or open hull space (aka external guns), cus... you need to balance it a bit huh? * This new loadout or configuration would be something... for another ship type instead of the Minotaur. I would not mind seeing this alongside with the Minotaur, instead of replacing the Minotaur. Yes indeed, altho it is not a request to make this ship. This above text post plus the picture post are just examples, as stated. I made the imaginary J-type to show-case the difference in Small Medium Large and Omni gun slots. (possible limitations for fitting). Further limitations can be made by the limitations on what type of gun can be mounted on the specific slot, like projectile energy. Just like there is now, no possibility to fit a gun to the launcher slot on the ship (already ingame). However, when not fitting a launcher, the ''slot count'' of that launcher becomes (or remains) available to fit something else on the ship. Like an ICX or patcher or Shield busting gun. However, When George is willing/ going bigger on ship all the way to capitals or battleships there should be balance between them. Such as, battleships not having to many small guns to kill small ships, because that above the armor and shield tanking capability's would make them overpowered very fast.